In a few weeks, a couple of my former classmates from the American School will be stopping by for a visit which gives me pause to reflect back once again. 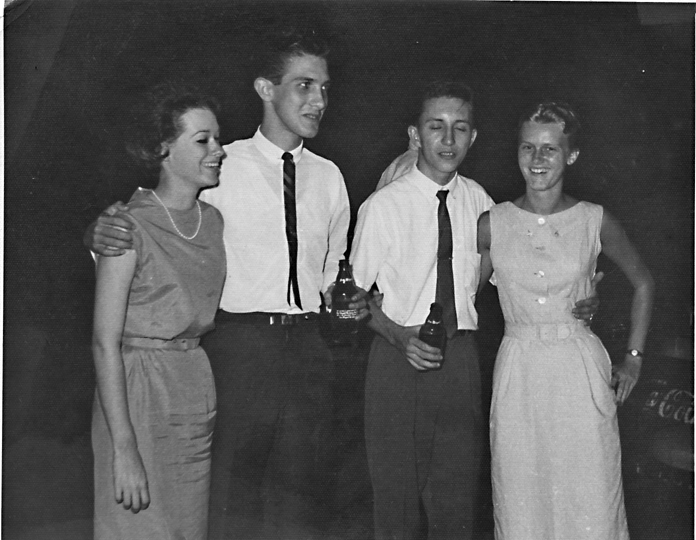 We graduated in 1962, looking ahead to a future of promise and perhaps even a sense of anxiety. We were to be let loose on a society that may not have been ready for us. Of course the beverage favored by boys my age was San Miguel beer. It was ubiquitous – everywhere. Were there other beers available ? Sure, but San Miguel was cheap AND good. I must admit it was an acquired taste but rather distinctive and when ordered at your local bar, it was often served in the inimitable Filipino style: warm with a glass of ice. I still look for San Mig today – it’s not easily available in Seattle but if you look hard, you’ll find it. I don’t think it tastes quite the same as I recall back in the Sixties but memories can play tricks on you. So this impending reunion led me to finding out more about this wonderful elixir. Where and when did the San Miguel Brewery get its start ? Back in 1889, a successful businessman, Don Enrique Maria Barretto de Ycaza y Esteban (that’s a mouthful), apparently enjoyed his quaff so much he decided to make his own and applied for a royal grant from Spain to establish the first brewery in Southeast Asia. He was awarded the grant for a period of twenty years. Rumor has it that the original San Miguel recipe was said to have been concocted by the religious Recoletos for “medicinal purposes”. Apparently following the traditions of past religious orders such as the Benedictine monks and their brandy. Perhaps alcohol was helpful to focus one’s “spirits” in chants and prayers ? Although I can’t confirm the original recipe for this beer, which the label states is “brewed from the choicest Bohemian malt and Czechoslovakian hops”, it certainly hit the spot and was immediately successful. 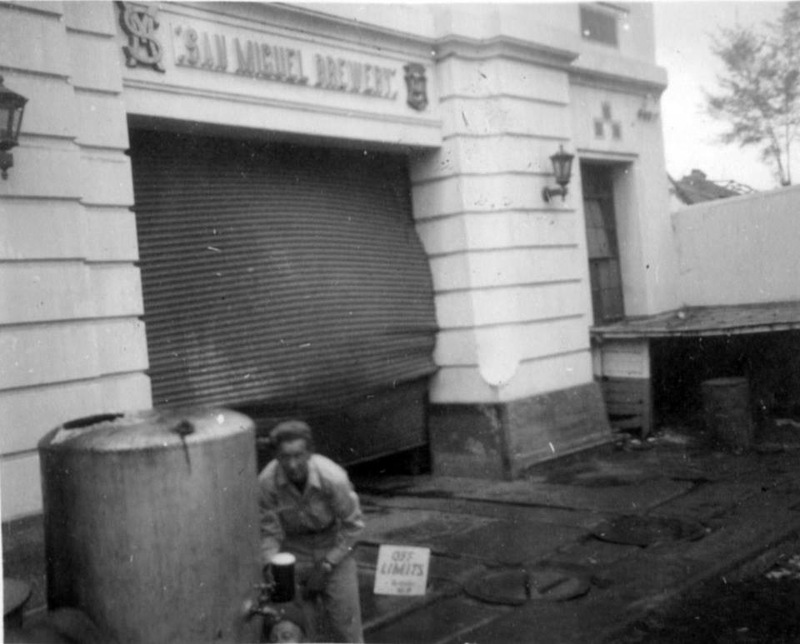 On September 29, 1890 (Michaelmas, or the feast day of Saint Michael the Archangel), La Fabrica de Cerveza de San Miguel was declared open for business. 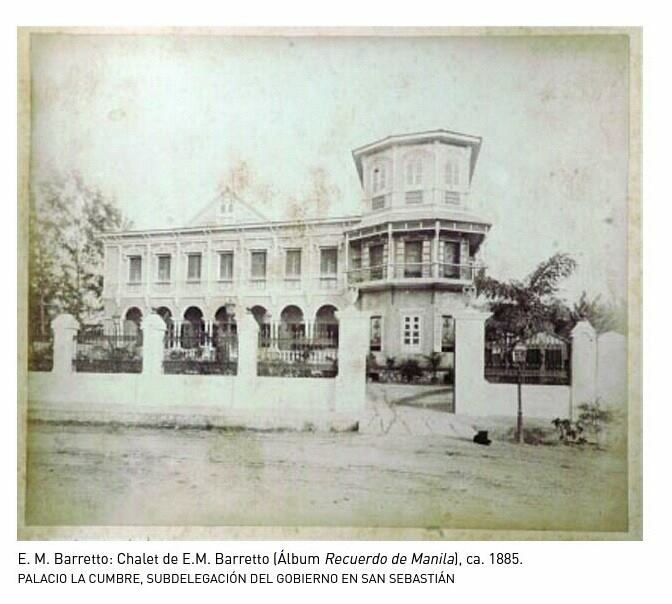 On a quiet, peaceful street in the more affluent San Miguel district, Don Enrique converted his large home, Casa Barretto, on 6 Calzada de Malacañang (later called Calle Aviles) to a brewery. I imagine his wife had at least a comment or two on that decision. The facility had two sections: one devoted to the production of ice with a daily capacity of 5 tons, and the other to beer production. With 70 employees, the plant produced about 47,000 cases of lager beer during the first year. 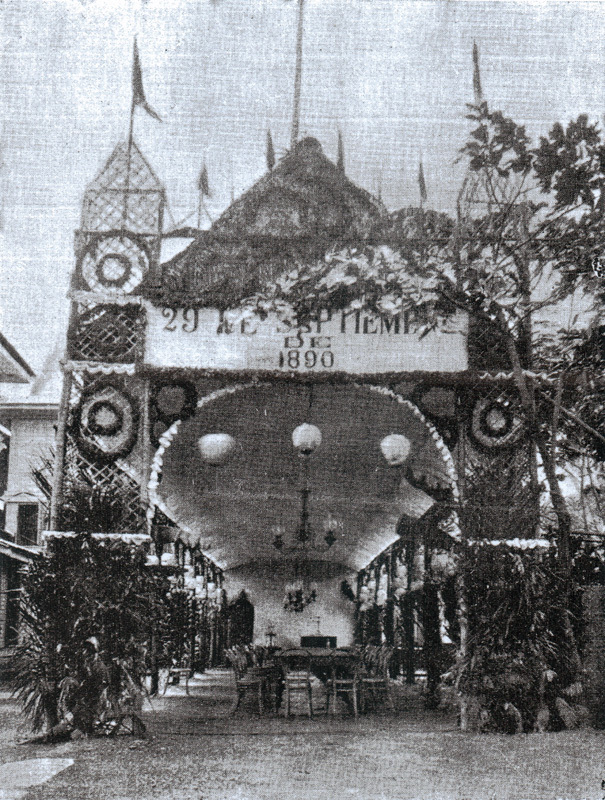 With great fanfare and pomp, a pavilion was erected for the inauguration of the Fábrica de Cerveza de San Miguel (named after the San Miguel district), originally scheduled for September 29, 1890. However, a tropical storm forced the event to be postponed to a few days later on October 4th. On June 6 1893, the company was incorporated and registered with a capital of P180,000. The incorporators were the movers of Manila’s business elite: Don Pedro Pablo Róxas y Castro, Don Gonzalo Tuasón y Patiño, Don Vicente D. Fernández y Castro, Don Albino Goyenechea, Benito Legarda y Tuáson, the heirs of Don Mariano Buenaventura y Chuidan and of course, Barretto. Róxas was soon appointed manager, playing a prominent role in the development of the firm. He remained with the firm until 1896, when he left for Europe. Prior to his departure, he bought a portion of Don Enrique Barretto’s interest in the firm worth P42,000, then purchased the balance of Barretto’s stake in the business later that year when Barretto retired. In 1895, San Miguel Beer won its first of many awards as a product of the highest quality at the Exposición Regional de Filipinas. By 1896, San Miguel beer was outselling all imported beers in the country by more than five-to-one. Don Pedro Pablo Roxas y de Castro had alcohol in his blood, so to speak. He was born in 1847 in Manila to Don Jose Bonifacio Roxas y Ubaldo and Doña Juana de Castro, of Spanish descent and belonged to wealthy families. Don Pedro was involved in the business interests of his father, among them a distillery and a sugar and rice plantation in Nasugbu, Batangas. In June 1834, Casa Róxas founded a distillery named Destileria y Licoreria de Ayala y Compañia. It produced a variety of drinks including anis, anisette, cognac, rum, whisky and its trademark gin, Ginebra San Miguel. 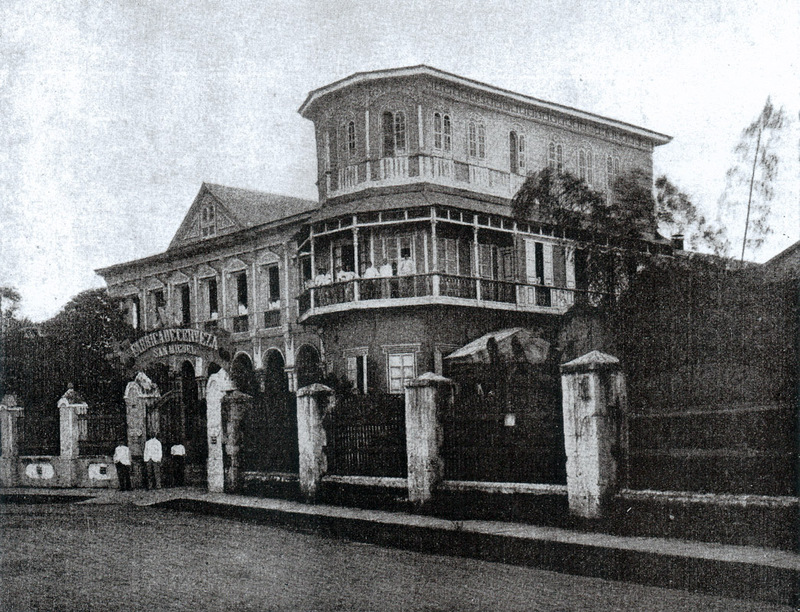 The distillery, which was located in Quiapo, Manila, was a major business of Ayala y Compañia (successor of Casa Róxas) until it was acquired by Don Carlos Palanca of LTI (La Tondeña, Inc.) on June 21, 1924. 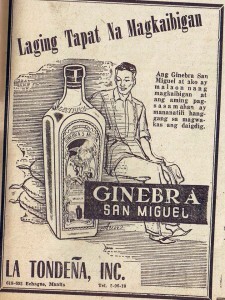 The “marca demonio” product label of Ginebra San Miguel is still in use today, was designed by Fernando Amorsolo in the early 1900s. La Tondeña was later sold to San Miguel in 1987, making it the world’s largest gin producer with a global market share of almost 50%. Incredible ! 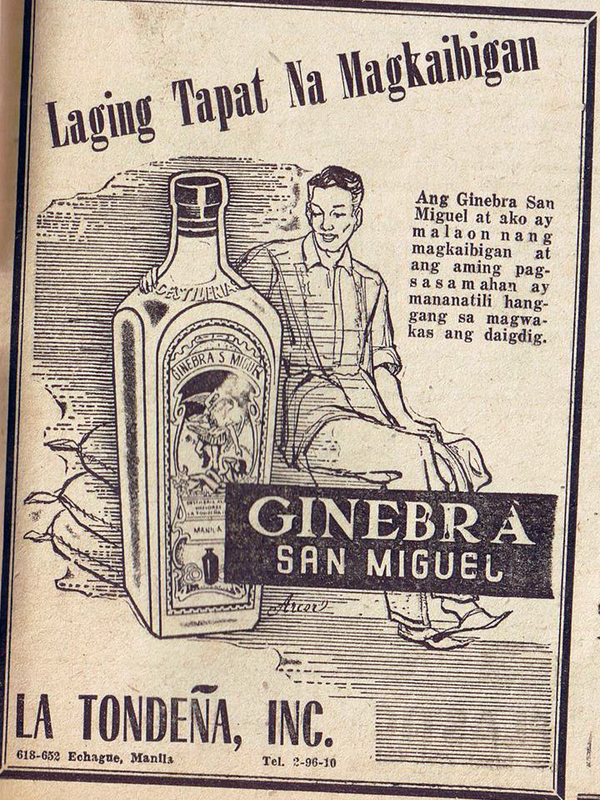 San Miguel Fifty Fifty ad from 1940. After writing about beer and spirits, one may think that’s about all I was interested in during my formative years in Manila but no … other beverages come to mind. In those days, I remember Coke, 7 Up, Bubble Up, Mission, Cosmos, and Bireley’s, but my absolute favorite was Royal Tru-Orange. 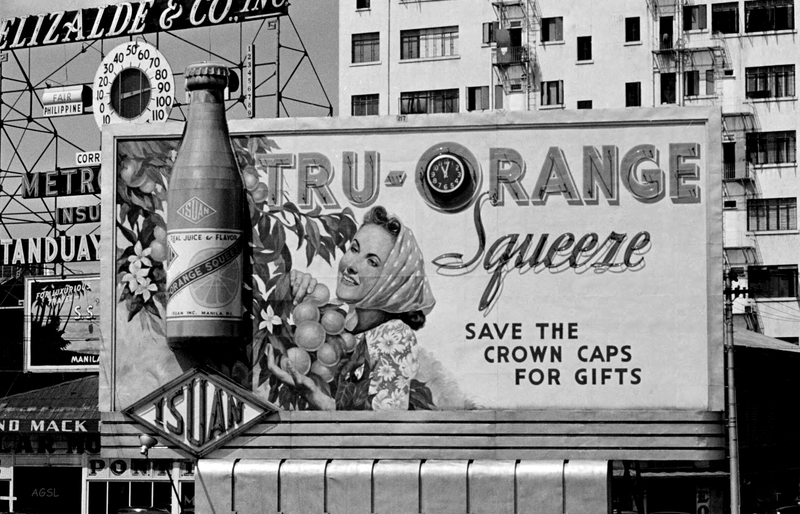 Tru-Orange billboard facing the Pasig River along Muelle de Banco Nacional in 1940. 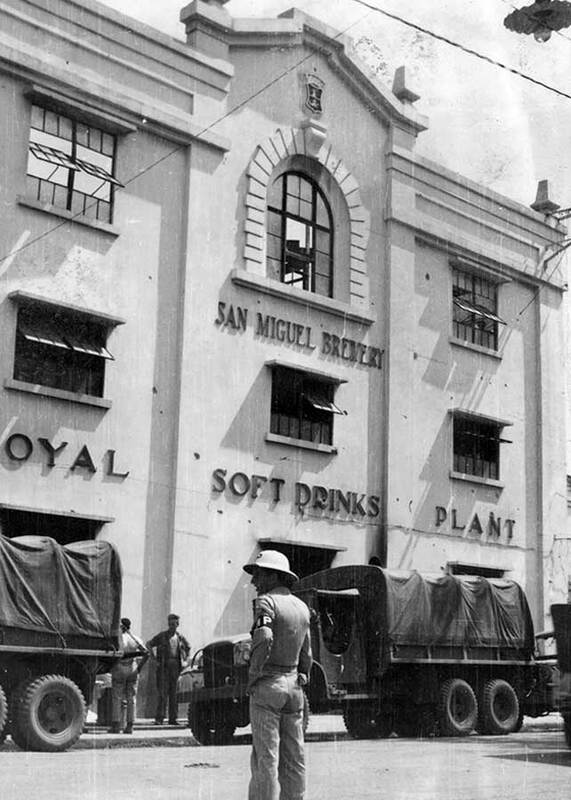 San Miguel Brewery began to diversify in the early 1920s by opening up a line of soft drinks and aerated water, starting with the Royal Tru Orange brand and soda. 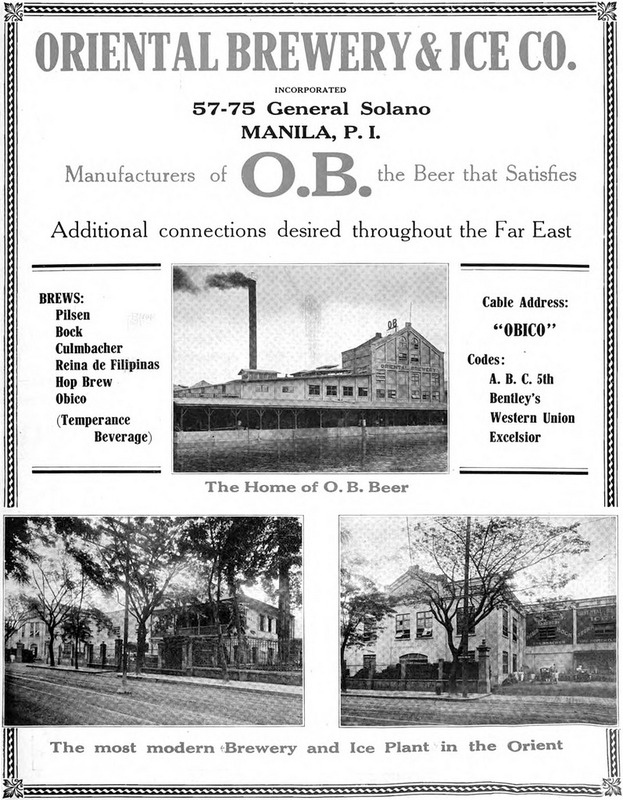 The company had acquired the Oriental Brewery and Ice Co. in 1919 from Don Antonio Barretto, Don Enrique’s cousin. The plant was transformed into an ice plant and cold storage that later became the Royal Soft drinks plant. It was the beginning of an expansion period for San Miguel as they secured the licensing rights to bottle Coca Cola in 1927. In 1920 Andrés Soriano, Sr., the 22 year old cousin to the Zobel family, joined the original San Miguel Brewery as an accountant. In six months, he became acting manager. 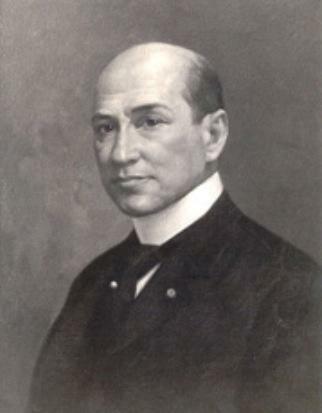 By 1924, he was its general manager, and in 1931, at the age of 33 he was elected as its president. In the 1930s, Soriano established A.Soriano Corp. (ANSCOR) as a holding company for a myriad of investments outside of San Miguel. Eager to expand even further, the San Miguel Brewery went into the ice cream business with the purchase of the Magnolia Plant. 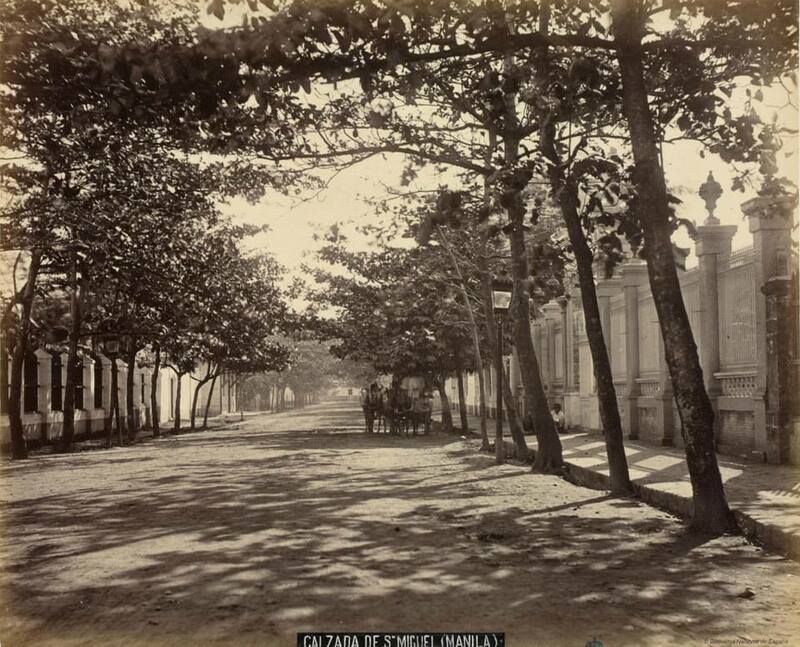 The new site used to house the Fábrica de Hielo de Manila which was bought by San Miguel in 1924. The history of the Magnolia brand can be traced back to 1899 when an American by the name of William J. Schober, who used to own the prewar Legaspi Gardens, arrived in the Philippines as a cook in the volunteer army and introduced the “magnolia pie”, “magnolia ice cream” and “magnolia ice-drop”. 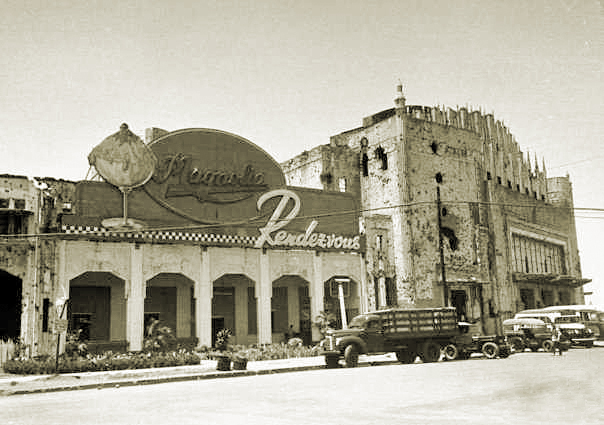 The photo below shows the Legaspi Gardens restaurant in the 1920s. 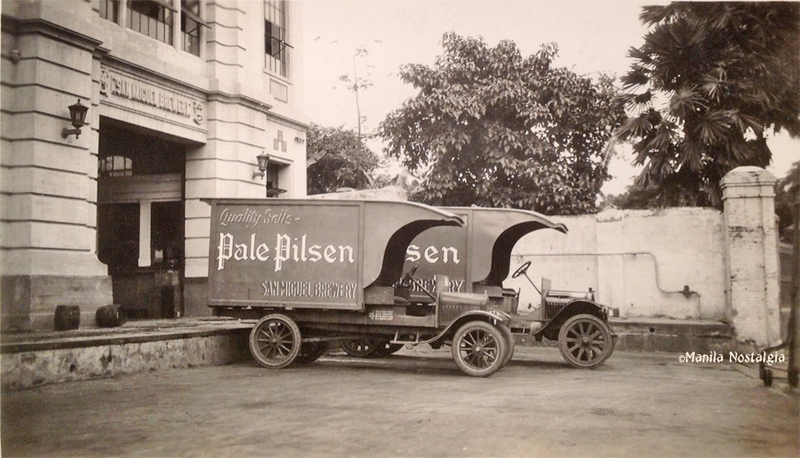 In 1925, Schober sold his interests to the San Miguel Brewery. 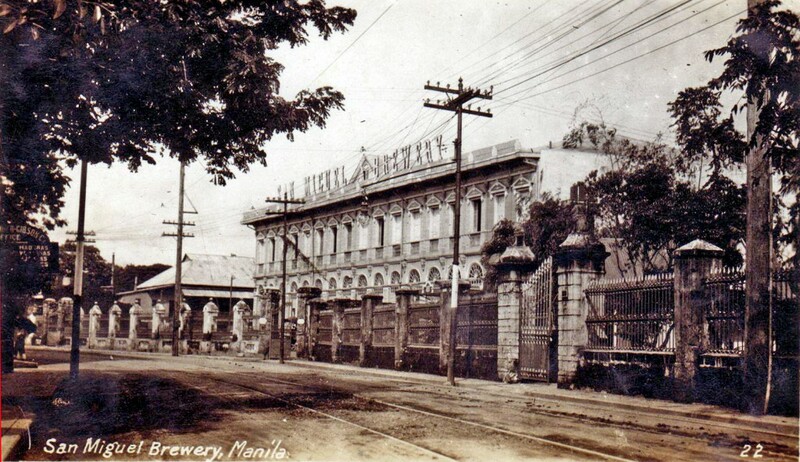 The dairy plant at 526 Calle Aviles in the San Miguel district of Manila stood on the same street as the original San Miguel brewery (6 Calle Aviles). 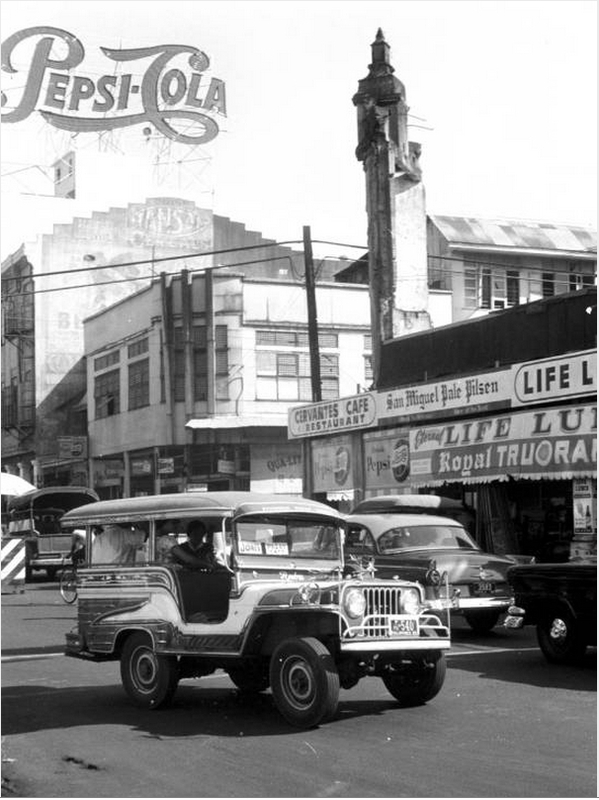 A year later, the dairy was relocated to Calle Echague (now C. Palanca Sr., Street) in Quiapo, Manila. In 1970, production was transferred to a new modern facility in Aurora Boulevard, Quezon City, known as the Magnolia Dairy Products Plant. 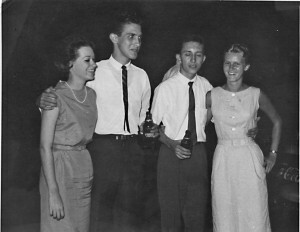 The facility also housed the main branch of its Magnolia ice cream parlor. Below, Magnolia retail store and office set up in the damaged Metropolitan Theater, c.1946. 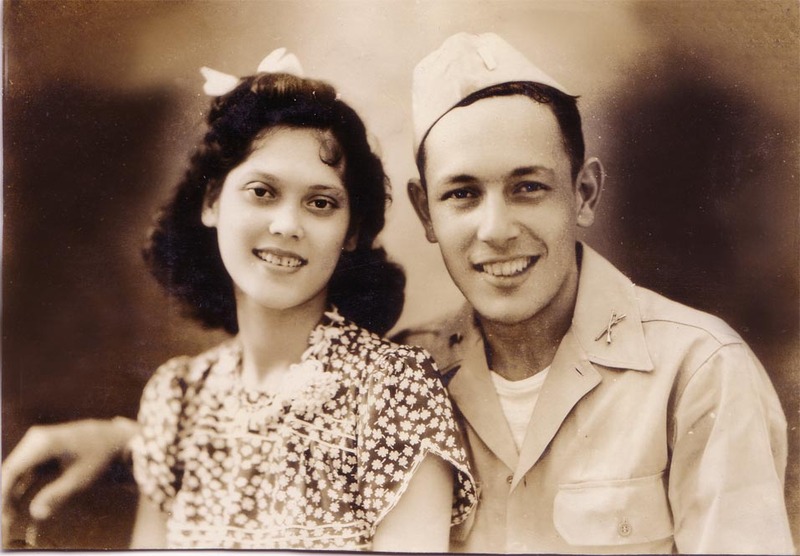 My tito, Enrique Gutierres, pictured on the left with his wife Lulu, worked at the San Miguel plant during the occupation. He was always joking around and was quite the avid storyteller. Of course, us kids loved hearing his stories. I recall him saying that the Japanese maintained operations of the beer plant by employing the Filipinos who had worked there before they took over. At night, the Filipinos used to piss in the beer and laugh outrageously to think this would be offered to the troops. I can’t confirm this as fact, but it was a good story. After freezing the commerce of the Islands, the Japanese made a quick survey of merchandise, machinery, and all other items held in warehouses as well as in business houses. 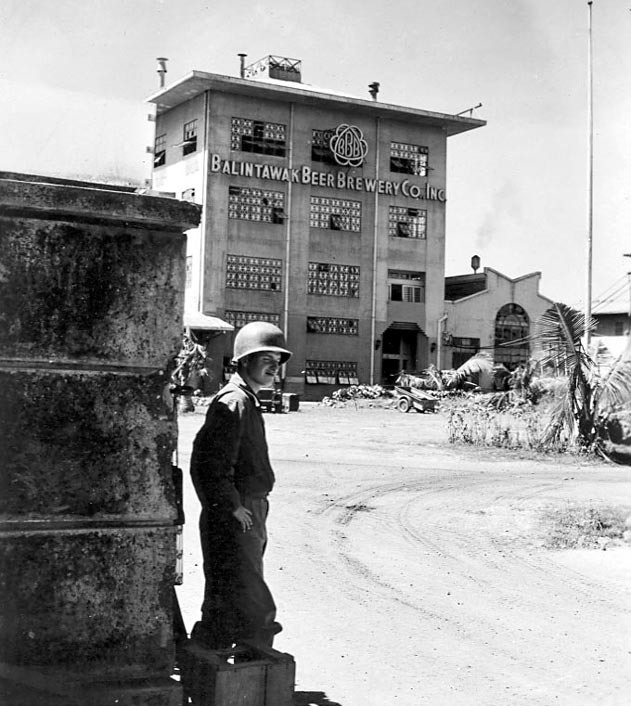 San Miguel Brewery’s stocks of beer were taken over, together with the entire plant, and placed in charge of the former BBB (the prewar Japanese-owned Balintawak Beer Brewery), which had been closed by the United States forces in December 1941. The smokestack at the BBB power plant had been destroyed, presumably as it was being used as a directional marker to the Japanese bombers during the bombing of Manila. Officials of the San Miguel Brewery were allowed to continue in attendance, but with no participation in the management of the plant. All operating personnel were retained on considerably reduced salaries. The beer in stock, and that which was manufactured after the occupation, was sent to the troops in the field daily. “Conditions in the Philippine Islands since the Japanese Occupation”, Chick Parsons, 1942. 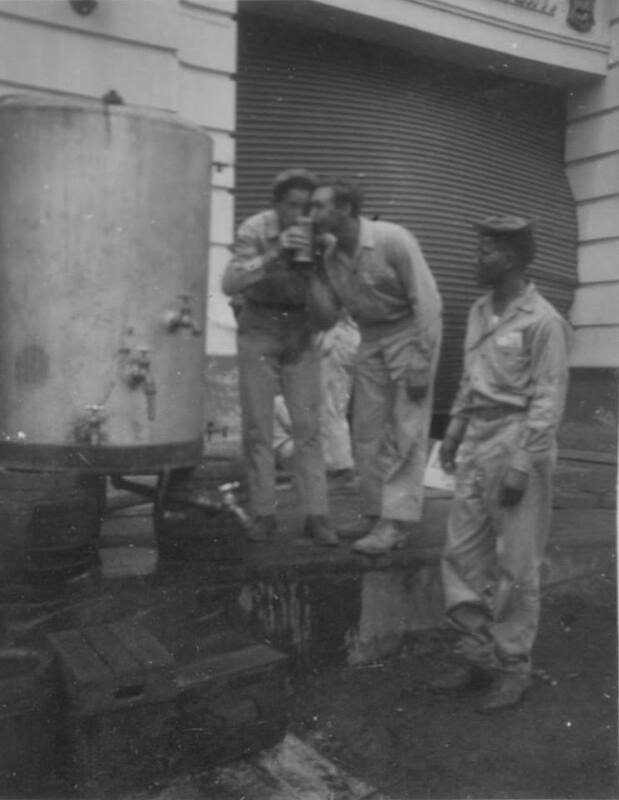 Above, a GI taps a refreshing drink. Apparently the “Off Limits” sign didn’t deter his quest to quench his thirst. You can be sure that probably one of the first locations well guarded by the liberating forces in 1945, were the buildings and stocks at the breweries. 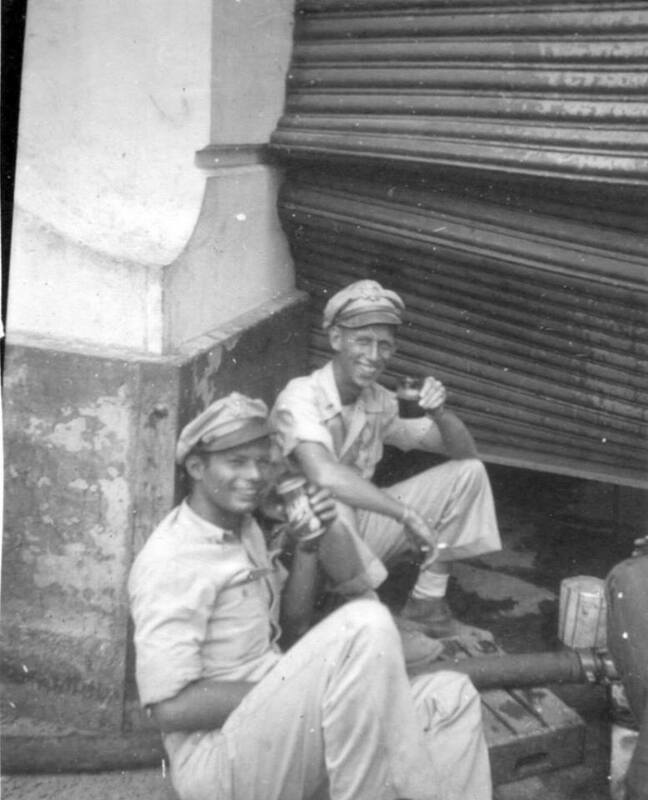 Although World War II interrupted San Miguel’s brewing business, the company got back on the growth track in the postwar era, acquiring production facilities in Hong Kong in 1948 and eventually licensing San Miguel beer in Spain through the Mahou-San Miguel group. When we traveled through Europe a few years ago, it was fun for an old expat like me to see our Philippine product, San Miguel beer, being sold everywhere. 23 Responses to My Favorite Beer ! Another important anecdote in our Philippine History. My office had a guest from the Latin America that once asked me, ” Hey Manuel, whats the best cerveza in this place?” I answered, ” San Miguel of course, need you ask?” Thanks for posting, Lou! 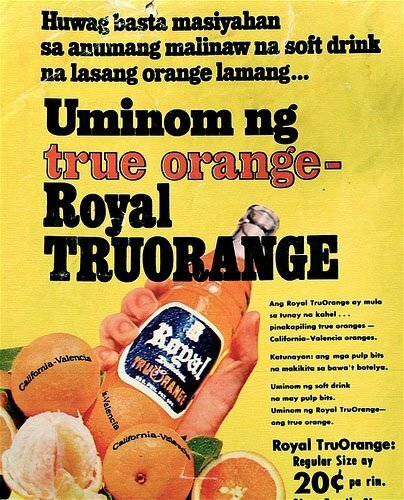 I’m a Royal Tru-Orange fan too, and drank that half the time; the other half being Sarsi. Bottled San Mig is certainly distinctive. When we visited Manila in ’95, I drank the draft San Mig and liked that better. San Mig is readily available in Vegas at grocery stores such as Albertson’s. Royal can be found in the Pinoy grocery stores there, such as Seafood City next to Boulevard Mall. What a wonderful contribution to knowledge about the past! I love how your article captured my attention to make a connection by describing experiences I can relate to. Thank you for opening up your affection on the page sir Lou Gopal…. And I knew he was correct about that; every time I visited his office at the Port of Manila, he had several bottles of soda, he took from Manila area plants, with various animal parts and vermin sitting at the bottom of the capped bottles. I would always double-check every Coke I got after that! …kudos Lou, i always look forward to your articles of the past.it truly puts me right into the past specially when people mentioned are folks i can relate to.some of .their siblings are people i know.-nice to know how they were all interconnected..Thank you again..Mr Gopal,you are the best! The first and last time I had a San Miguel Pale Pilsen was 30 years ago. The San Miguel being sold here in US is not the same. Pilser Urquell is a close second – if I need to remember the taste of San Miguel. At any rate, I decided to visit the Philippines after being away for 30 years. A stranger in a strange land, indeed, but no a stranger to that Pale Pilsen. Argh! just can’t get that beer . . .
one business trip to Ponce, Puerto Rico, I stopped at a seaside restaurant. I had fresh fish, rice, and a bottle of San Miguel beer (or was it two) – what a treat. San Mig really needs to up the ante when it comes to their beer. Cervesa Negra perhaps is the only thing beer connoisseurs around the world regard as the best san mig product. They should delve into craft beers and ale in my opinion. I used to love San Mig in the 70’s but they changed the recipe and it’s really not that good any more, kind of bland and watery. I remember their ad would say “mag beer muna tayo”. Loved that orange soda too! The Magnolia green peppermint sundaes were to die for. I think Magnolia is finito, I didn’t see it in the stores in 2010. Thanks for the article Lou. Where did the Soriano’s came into its history? Great article. Graduated high school in ’64 in San Beda and always wondered about Aviles. When we went to Paco with my dad in the late 50’s, we would always pass Otis and the car would slow down so we could watch the rows of moving Coca-Cola bottles being refilled at the Coca-Cola plant. Nagtahan Bridge was then a Bailey bridge. It would always go “clickety-clack” when the car passed over it. I really enjoy reading the article. Thanks. This is very useful to my school project. While living in Guam, I found many San Miguel & Pedro Rojas (PR) bottles in the old Agana dump. 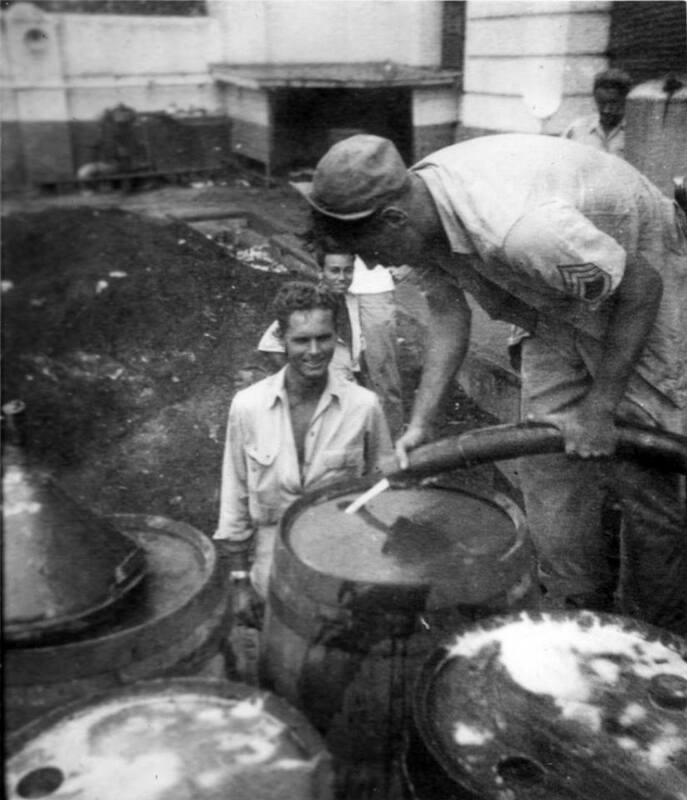 Did some research and found that San Miguel was first exported to Guam from Manila in 1913. I contacted the San Miguel Company, and ultimately sent them several old bottles as they had requested. I remember Jennings Bunn. I too have found many San Mig bottles; not only at the Agana dump but other pre war dump sites as well. Sounds like Jennings found the green SM bottles of which there were 2 types. The older type read: Succs. De Pedro Rojas Manila. The newer green type had a B in a circle and read: Succsors of Pedro Rojas. A very few clear bottles(not green) also with B and same wording can sometimes still be found. These green bottles were made in Japan and Hong Kong as San Mig didn’t have a glass company until the early 1930’s. These bottles can still be found for sale in village public markets around the P.I., so I think Jennings’ bottles are now in the private collections of San Mig employees. The first style of green bottles were hand blown from carved wood molds. The 2nd. style with the B were semi auto machine bottles. Prior to the greens, which were crown tops, there was a blob top hand blown wood mold bottle that read: San Miguel Brewery- Manila, which was embossed on the front of the bottle. I found a few of these in a dump site that was started in 1905. So before the official San Mig export from 1913, the Japanese sailing Maru boats were bringing in products to Guam from the P.I., Hong Kong and Japan. One of these boats was quite successful and the owner was not only the shipper/importer but the wholesaler, as well as a retailer. After the greens, there were the brown bottles which sill had the SM on the neck but some of which have stateside bottle makers logos. These date from the late 1920’s to the 1early 1930’s. Later on these browns were the first bottles made in the P.I. by San Mig. I also have found Balintalwak (BBB) bottles in a small village dump site. At a different village dump site that was closed in the early 1920’s I have found the very rare Orential Brewery and Ice Co. bottles which were also made in Japan. 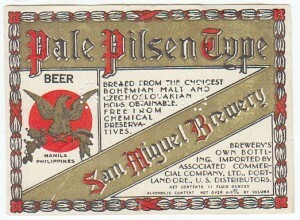 there was one prewar Filipino ad from San Miguel tells about the beer’s medicinal properties such as giving vigour and strengthens the nerves. “Ang Cerveza San Miguel ay nagdudulot ng malaking kapakinabangan sa katawan ng mga Manggagwa. Ang isang anakpawis na nanghihina ang katawan at lagi ng matamlay sa paggawa ay kinakailangang uminom ng CERVEZA SAN MIGUEL, pagkat ang inuming ito’y hindi lamang gumigising sa nanghihinang ugat ng mga bisig, kungdi nagdudulot pa ng masaganang sustansia upang sumigla ang katawan. My classmate in San Beda forwarded this blog to our Yahoo group. Good stuff all around – kudos to the blog owner. The Barretto brothers, sons of former Zambales Gov Barretto are alumni of San Beda. The younger was my classmate in the elem grade & high school. From their cousin I learned of the San Miguel story. It’s a good read! I just have a plain question about where did the ‘y Esteban’ come from in the full name of the founder Don Enrique. In his portrait, it was just written Don Enrique Maria Barretto y Ycaza. Late to the party here. Made a bet with myself that the story about Fernando Amorsolo being invited to teach at a Spanish fine arts academy after designing GSM’s “Marca Demonio” logo was but a heartwarming but false tale. Somehow I wound up here. Great article though. I love the pictures too. I found it funny that the American Caesar partook of the beer offered to him. If your uncle’s story about adding that extra ingredient to the beer was true, I wonder if the beer MacArthur had came from the same batch.